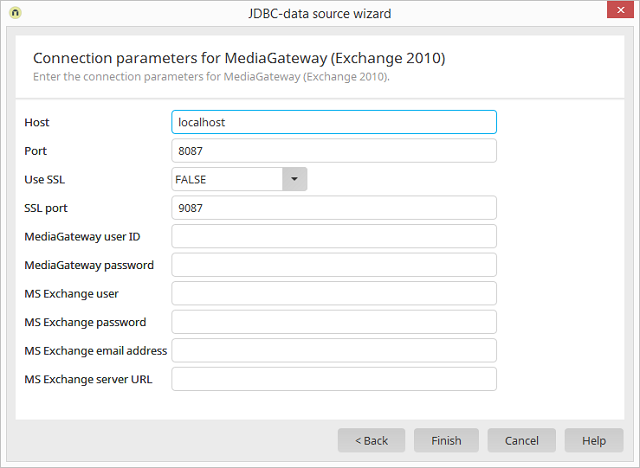 Integration module Create Data transfer General settings / Type of data source: JDBC Source - JDBC database / Click on Wizard Select data source (e.g. MediaGateway 2010) / Click on "Next"
In this dialog, all of the connection parameters for the database type, which was selected in the previous dialog are shown. The MediaGateway User ID by default in Intrexx is "administrator", the password is "1234". Information about the further entries can be found here.